Database Systems Corp. (DSC) is a leading provider of call notification and emergency alert phone services with IVR and voice broadcasting technologies. DSC also provides turnkey phone systems for small to large call centers. Technology from DSC is ideally suited for community service programs such as telephone reassurance programs. DSC provides a telephone reassurance program called CARE (Call Reassurance). 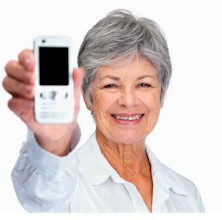 Our CARE phone system automatically contacts elderly residents who subscribe to this service. The CARE system plays a recorded prompt, asking "Are You Doing OK?". If the call is answered, our CARE system knows automatically that the resident is OK. The CARE recipient can optionally press a phone key, acknowledging that they are OK or they can request assistance by pressing a different key. What Is A Telephone Reassurance Program? "Telephone reassurance is the common name for a service offered by many local communities that contacts the elderly or handicapped on a daily basis using a phone service. These residents are called to ensure their well being and the service is provided for community members without family or who need temporary monitoring during times when they have limited mobility." Besides calling seniors, some communities provide an I'm Ok senior call-in service that allows subscribers to call into the CARE automatic phone answering system using IVR technology. The CARE system acknowledges that each calling senior is OK. If the senior does not call the CARE phone system by a designated time, CARE automatically calls the senior to see if they are OK. Contact DSC to learn more about our telephone reassurance phone systems and services. For a list of other applications and services provided by DSC, please visit our phone applications web page. "Gibson Country dispatches Police and Fire Departments for seven towns, as well as the Gibson County Sheriff's Department, County Ambulance Service and County Fire Departments. We do National Crime Information Center (N.C.I.C). computer work for seven towns and the Sheriff's office in Gibson County and for all of Crockett County." The Gibson County Sheriff's Office uses the CARE telephone reassurance system from Database Systems Corp. to provide its senior citizens with a phone reassurance service. Citizens can be called daily free of charge to ensure their well-being. Contact DSC to learn more about our CARE system and other phone services and systems.